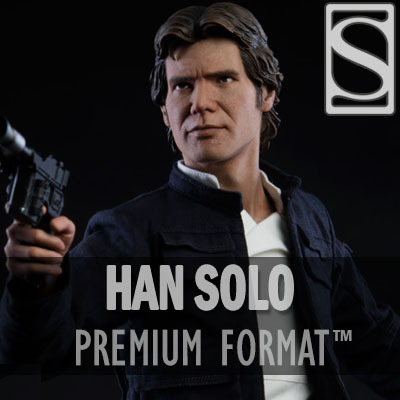 He just got back from making the Kessel Run, and now he’s ready to join your collection- Sideshow is proud to present the Han Solo Premium Format Figure. For the look of this figure, Han Solo has been brought to life straight from Star Wars Episode V: The Empire Strikes Back. His detailed portrait has been sculpted to capture the likeness of Harrison Ford. The Han Solo Premium Format Figure has an authentic Episode V costume sewn from fabric and leather elements to give his look an added sense of realism, down to the details of his belt. Taking an action stance with his blaster, Han is ready to shoot first when his enemies come to collect what he owes. He stands on top of a Millennium Falcon inspired base to complete the scene, proving this smuggling scoundrel has the heart of a rebel. The Exclusive edition of this statue comes with a right hand equipped with an E-11 blaster for additional display options. No time to discuss this as a committee- pre-order the Han Solo Premium Format Figure for your collection today!